The triphasic pill contains the lowest dose of progestogens given per cycle. The recently introduced desogestrel-containing combination pill is claimed to have less androgenic side-effects than combination pills containing levonorgestrel. A better comparison would be between the triphasic pill and the desogestrel-containing pill. This is the purpose of this report. The following items were measured during the follicular and luteal phase of a control cycle and during the third week of pill intake of both the third and sixth pill cycle: body-weight, blood pressure, total cholesterol, HDL-cholesterol, fasting triglycerides and testosterone. Blood glucose and insulin levels were measured during a glucose tolerance test at the beginning and the end of the study. Body-weight increased and blood pressure remained unchanged during the control cycle. Both pill types had no influence on these parameters. Total cholesterol, HDL-cholesterol and fasting triglycerides showed no significant changes during the control cycle or during pill intake except for a significant decrease of total cholesterol in the desogestrel group. The triphasic pill did not alter the glucose or insulin response to glucose. In the desogestrel group both these responses increased significantly. Testosterone increased significantly during the control cycle but no significant changes were observed during pill intake in both groups. 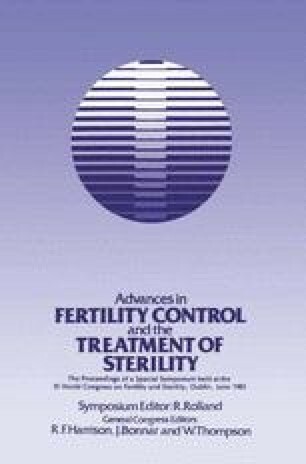 It is concluded that the observed changes in biochemical and hormonal parameters are minor and only reach the level of significance in the desogestrel group.